You all know that I have a great love for the paranormal, but did you know that I have a mad love for zombies also? It’s an acquired taste, for sure, and my darling husband was the one who made me acquire it. A good zombie story is NOT about the zombies. It’s about the people and their relationships in the post-zombie apocalypse world. One of the best stories I’ve read in a long time in the P.Z.A. world is by a good NA writer friend, LJ Baker– “Save Me”. It’s a fantastic story about Andi and not only her struggle to survive but to find a way to actually live– and love. 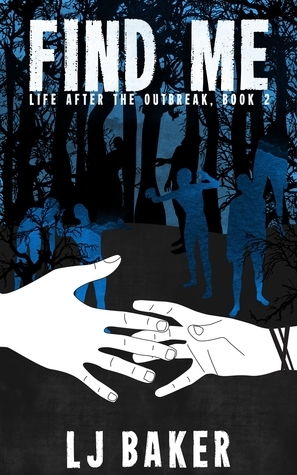 And now, Ms. Baker’s giving us the second installment of her “Life After the Outbreak” tale today! “Find Me” is out for our reading pleasure– and don’t worry if you haven’t read #1 yet. While I think that you’d love it, and it will give you more information, you can slide right into the world with this. Against the odds, Andi is not only surviving in a world where flesh-eating undead hunt the living, but has managed thrive. When she first went through the gates of the military base with Will, she thought it was their chance for a normal life. Well– as normal as they could have during a zombie apocalypse. But life on the military base was nothing like she expected. Training takes every ounce of energy she has. With few friends and Will gone more than he’s home, she’s left to wonder: was staying the right decision? He pulled me back against him and paused, his lips so close to mine that I could feel his breath against them. “If it were up to me, you’d never be out of my sight.” His voice was low and deep. Something about the sound sent my pulse racing and kicked the temperature up a few notches.